the risk of grief you'll run. And for the happiness you'll know forever grateful stay. I gently pass along to you my deepest condolences for your loss. May each day that comes help to bring a greater sense of peace for you. Big bear hugs from NYC! Jeanne, I've been asking Tim if you were all right. I heard about Malachy when I was in Dallas. It's so very sad and I am so sorry for your loss. Take good care of yourself ... Remember how much joy and love Malachy brought to your home. Jeanne, I feel like I know you because of my friendship with Tim. I'm sorry for the loss you and your family have experienced. Tim spoke of Malachy often, and I am certain that the wonderful memories you have will fill your heart. I'm a friend of Tim's and just wanted to express my condolences on the passing of Malachy. I enjoyed hearing stories from Tim and know this must be so hard. Remember the good times and joy that Malachybrought into you life. Thank you all so very much for your thoughtful words. Your kindness means more than you know. I'm a friend of Tim's from LiveJournal. My condolences to you and the family on Malachy's passing. 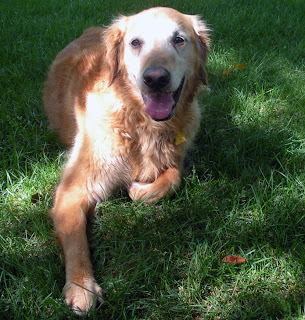 I grew-up with a Golden Retriever-- they're such great dogs. May Malachy always be with you in Spirit as you remember what fond memories you have of him.